Sony Xperia Z3 Tablet compact is said to be the “World’s slimmest, lightest waterproof Tablet compact from Sony ( as per official blog source of Sony ), we have seen the Xperia z3 tablet compact to be launched in IFA 2014, and more over we have seen Xperia Z3, Xperia Z3 compact, Xperia E3 in IFA 2014 which were already launched into the market and this slimmest tablet from Sony is yet to launch. From the official blog of Sony, it is confirmed that Xperia Z3 Tablet compact is going to launch soon in this month. 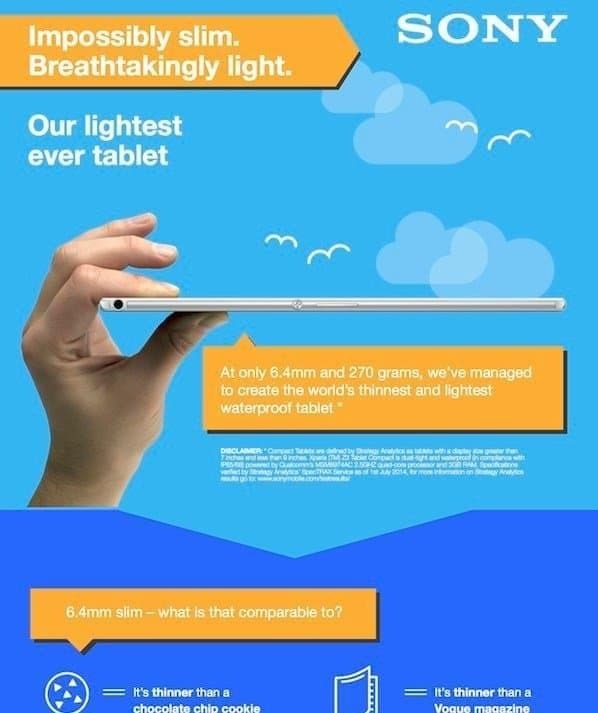 How many of you are waiting for this : slimmest, lightest waterproof tablet ?